This will be a special day of mandala making and sound healing!! We will start and end at my studio in Forest Knolls and midday we will be traveling to San Rafael (to this church: San Rafael First UMC, 9 Ross Valley Drive) to participate in a luscious sound healing offered by Rene' Jenkins and Angelica De Luz. Illuminating our Resilient Hearts, as we join in prayer and financial support for the Water Protectors! 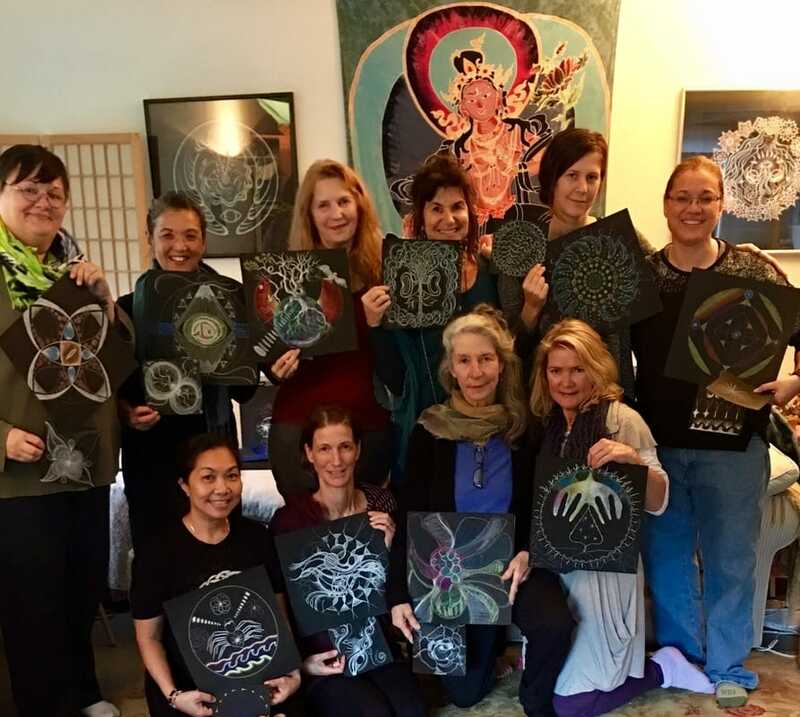 Open to new and experienced Mandala makers ... for Life Affirming Co-Creation, Healing and Solace ... this is not about drawing ... it's about inviting our cracked open wide hearts to let the tears & passion for LIFE flow, the light stream from our hearts and our hands. 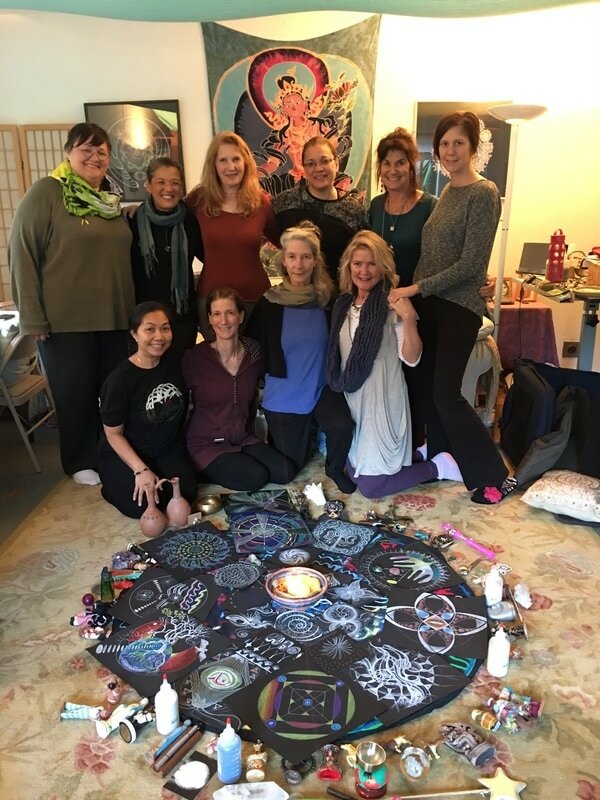 T O G E T H E R we invoke a Living Mandala (sacred circle) through Intention, Sound Healing, Energetic practices, and Light ... If you have been curious about joining me ... you will inspire & be amazed! As an artist, teacher and a woman devoted to the precious resources of both human and this planet, I am moved to stand up for the Water and Water Protectors at Standing Rock. As awakening individuals acknowledging our interconnectivity, we can make a difference. We must make a difference. So I invite you to stand up with me -- to gather at my studio for a potent day of solace, sound healing, prayer, love and mandala making. Through a co-created process, (receptive to ALL spiritual traditions), we will Illuminate our Resilient Hearts creating a healing circle of encouragement. We will remember our divinized human hearts -- hearts capable of living beyond reactivity and interpretation. We will become truth sayers through mandala art, beyond any need for words. We are not separate from the infinite creative potential animating this Universe. Rather we are unique, individuated expressions of that unitive awareness... an integral part of the Love of Life Itself. What happens to one, happens to all. What happens to our Earth, happens to us all. My thoughts and words either heal or harm. When I embrace what is authentic (whether pain or joy), this elicits healing and grace. We are the meta-physicians learning to "illuminate our resilient hearts". If you are just meeting me, I have been sharing this Living Mandala HeART path for 20 years. It originated through my teacher Dr. Judith Cornell. *Please scroll down to read more about this process! If you live outside the Bay Area, please get in touch as I will offer this and other events online... AND if you want to help host and co-facilitate please get in touch! P L E A S E join us. Again, this offering is not about drawing ... it's about inviting our cracked open wide hearts to let the tears & passion for LIFE flow, the light stream from our hearts and our hands. T O G E T H E R, we invoke a Living Mandala (sacred circle) through Intention, Sound Healing, Energetic practices, and Light ... you will be inspired & inspiring! This is not a "sit down and draw" art class ... it's just about being willing to open your heart even more and let your mind take a vacation! New Students: If you have NOT done mandalas with me before ... there is a $25 materials fee (you get to take the materials home with you). You can pre-pay for your materials using the button below. Please commit to being on time and staying until 4 pm (unless pre-arranged with Julia), for the benefit of the group and the sacred container we are holding. Please register by Friday Feb 24, as space is limited. Directions will be sent out with your confirmation letter. *Effortlessly manifest your own radiant mandala through a visionary process combining meditation, movement, ritual, sacred sound & simple drawing techniques. Prior drawing experience is not necessary, only OPEN HEARTedness! All traditions welcome. 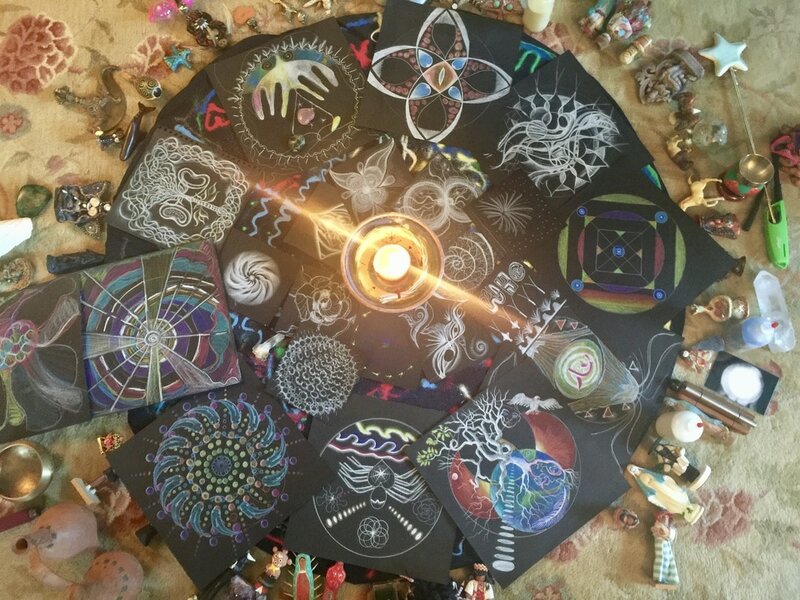 In the intimacy of a small group you will receive and allow your own unique luminous vision to manifest on black paper with white and colored pencils. The Living Mandala Process invites you to experience and express the Circle of Light inherent in all life. Your heart’s beauty will be reflected back to you on paper and through the living mandala of our human circle, the group. Perceive and reveal the Light inherent in all of Life! Unleash your creativity and manifest sacred mandala art. Embody your inner wisdom and healing capacity. Learn sound healing, and embodied energetic practices from Sufi, Qigong, Yoga, Kabbalah and other ecstatic traditions. Activate neuroplasticity & biophotonic resonance within your cells. Experience a revitalized capacity to be living mandalas (sacred containers) in and inseparable from nature! (If you live outside the Bay area please get in touch - I also plan to offer this workshop online.) AND if you want to help host and co-facilitate please get in touch... I LOVE to collaborate! Read more about my workshops and background, or see students mandalas, click my website links above.